Back in March, when my trusty Citizen® Eco-Drive solar watch appeared to act up, I ordered an inexpensive solar watch to keep me on time during the interval of sending the Citizen in for repair, and waiting for its return. Luckily, as described in the post I wrote on the subject, I figured out my watch merely needed to charge properly (see Out of Time). I then had an extra watch I likely wouldn’t need for years, if ever. 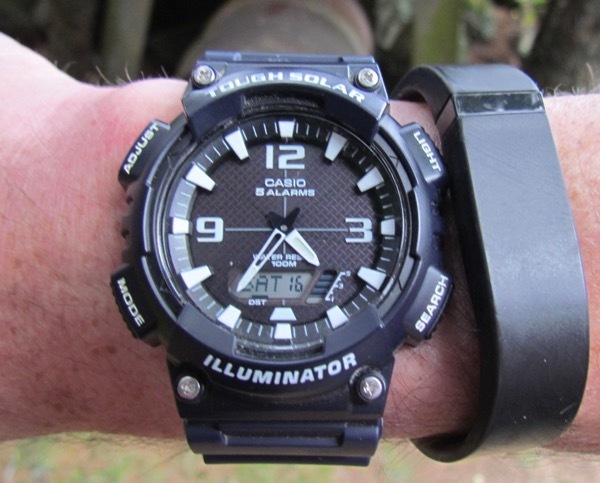 I’d chosen a really nice watch for under $35, a Casio® Tough Solar Analog/Digital. I set it on the bedroom window sill to keep charged against the far distant day when I might need it. 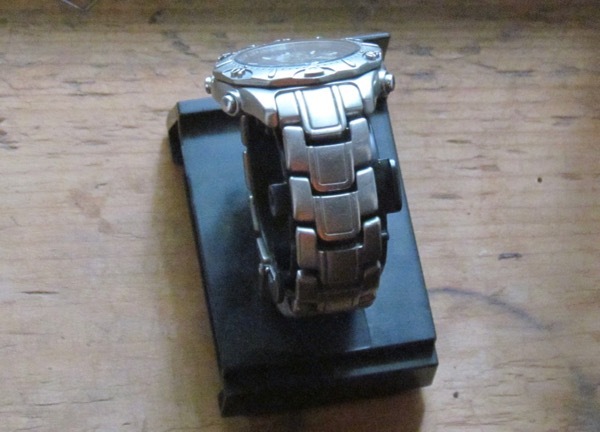 The Casio solar watch, left of my Fitbit (Photo: Michelle L. Zeiger). That day came sooner than I thought. In a couple of weeks, we’re going on a big trip. 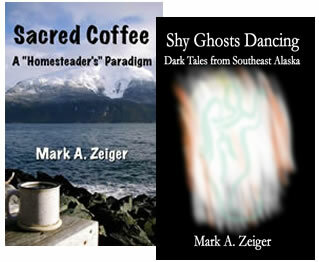 I’m not ready to go into details just yet, but it’ll take us across many time zones. One feature of the Casio that my Citizen doesn’t share is the ability to track and show several time zones without adjusting the watch. That makes the Casio seem more useful for this particular project. So, rather than grab it on the day we leave, I’ve been wearing it recently, to make sure it’s going to be comfortable on the trip. Thankfully, it is. It’s very comfortable. And, except for lacking a moveable bezel, which I find very useful on the Citizen, its features will come in handy on the trip. My every day watch vacations in the sun, literally soaking up rays until I need it again (Photo: Mark A. Zeiger). It’ll be nice to get some use out of this “back up” watch. Then, when we return from traveling, it’ll be nice to get back to my trusty old reliable, every day watch.